Honda Philippines, Inc. keeps on delivering breakthrough innovations in the local motorcycle industry with a variety of excellent product offerings that suit every Filipino’s need for everyday commuting. Last year, it has launched four motorcycles that are both high on design, style, and functionalities, and also featured groundbreaking technologies that only Honda can deliver with superiority and class. The newest product offering that has come off Honda Philippines’ assembly line is its new generation sports motorcycle known as the RS150, which was officially launched in November last year and is currently making its way to Honda dealerships all over the country. More than its stylish and sporty looks, the RS150 has a major plus factor going for it that no competition can match at this point in time – it is powered by a new generation liquid-cooled, 150-CC, DOHC, six-speed sports engine. The groundbreaking engine was borne out of Moto GP DNA, officially making it the latest iteration to the world-class racing engine suited for sports motorcycles. The new generation engine of the RS150 also comes with class-leading advance technology, giving its users additional advantages over other sports motorcycles. Like the other motorcycles that were introduced by Honda Philippines to the Filipino market last year, the RS150 is brimming with excellent engine technology which is just beginning to catch on with the competition. It features an intelligent and accurate programmable fuel injection (PGM-FI) which is capable of supplying the optimum fuel and air mixture in the combustion chamber for efficient engine power while ensuring low emission. In fact, the motorcycle has been proven to comply with the stringent Euro 3 standards, which means that it has very negligible emission or effect to air pollution. 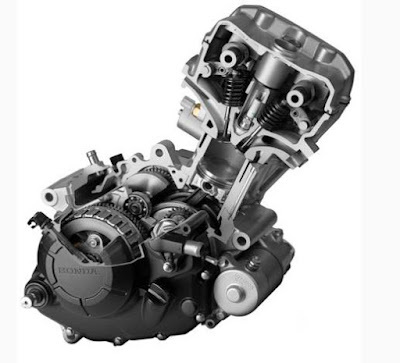 The sports motorcycle also has other features to complement its excellent engine performance including an O2 sensor, a catalytic converter, and a bank angle sensor. The engine of the RS150 is also liquid-cooled with auto fan. It features an advanced radiator with electronic fan that automatically turns at a temperature of 103 degrees Celsius to prevent any form of overheating and maintain a consistent and safe operating temperature throughout the powertrain. The RS150 is also the first motorcycle model under the Honda sports category and given its positive and warm reception from its initial owners and prospective buyers alike, it is certainly not going to be the last. It is likely that the next exciting sports motorcycle models from Honda will be utilizing the same engine now being used on the RS150 while continuously building on the technology that the world’s No. 1 motorcycle manufacturer has been known to do. In terms of other innovative technological features, the RS150 sports a futuristic digital meter panel to keep the driver informed of vital operational indicators. It also has sharp and sporty LED headlight to ensure brighter illumination especially at night. For security purpose and protection against theft, the RS150 also features an auto secure key shutter. As far as its sporty, stylish, and functional design goes, the RS150 has a clip-on handle bar to support sporty driving style, stylish tail light, sporty cast wheel with tubeless tire, sporty pillion step, and sporty under cowl. For added safety and protection of the driver, the RS150 features a twin perimeter frame to support engine performance and maneuverability even while driving at great speeds, a front and rear disc brake, and a rear monoshock for optimum shock absorption. To know more about this superb engine and to get updates on the continuation of the Gen S story, connect with Honda through their website or visit the Honda Philippines Facebook Page or contact the local dealer nearest you!